Different genres, approaches and themes. Some images from a selection of photographic essays, assignments and commissions below. Film on imdb.com and under Writing. Reviews here. Voting filmmaker member of the British Film and Television Awards for years. Most recent digital artwork, Coding Me, Coding You was featured at the European Parliament in Brussels. The human impulse to categorize. The Darwinian propensity to classify. Then categories come alive. And live on through memories and attitudes. Polar self Portraits (PsP), the film, is an international art project produced by Creatives without Borders. PsP is about the self, polar landscape, and climate change. I invited artists from six continents to re-imagine the boundaries of 'landscape' and 'self-portrait' in the context of climate change. Audiences have seen the film in a wide variety of venues, including an art museum in the Arctic, research stations in Antarctica, contemporary concerts in NY, universities in Albania, England, Macedonia, an old watchtower in Croatia, a philosophers' salon in England, and an art gallery in Morocco. It is selected for screening and discussion for the featured programmes of the Florence Biennal, eARTh, in October 2017. Inside the creative process, amplified fluidity, obsession, flow. Images for Art?Works, a choral work based on my poem, premiered in Manhattan. Sounds shapeshifting, scores coming alive. Inspired by contemporary music making, German expressionism, Stravinsky and Matisse. Bauhaus meets medieval. A moated castle in the heart of France, re-imagined in Bauhaus language. Archeology of the Industrial Revolution, by the Rochdale Canals, in Manchester. A transfigured Sleeping Beauty, a castello dorme in Milan. And la carovana next to it, recharging it with life -- in the images. Adore Noir, the fine art photography magazine features in its no 35 issue The Curious Case of the Vanishing Ice Caps, a selection from my Arctic expedition work, and an interview. Adore Noir champions, as the title suggests, black and white photography, featuring artists from around the world, publishing from Vancouver, Canada. Adore Noir is distributed as a digital product of the digital age, with minimal carbon footprint. A meeting, a departure; the beginning or the end of a story? Freud's passage to London started here. Deutsche Börse Artist Residency at the Frankfurter Kunstverein. Germany. Public lecture at Deutsche Börse Frankfurter Kunstverein about the Migrant Identities photography project. 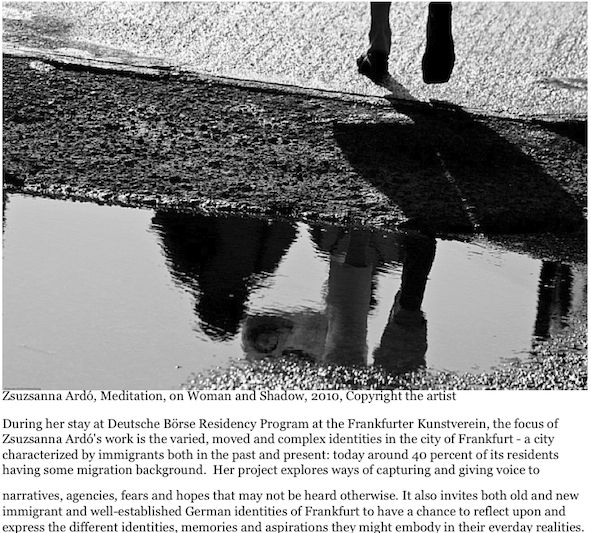 The European Artists Residency, Germany. Chronological time versus supreme moment in time. Desert days with Beduins of the Sinai. Sleeping on sand, travelling on camels; burnt by the sun, caressed by the stars. Ne-Yo, American musician in action. Contact sheets of concert in the streets of New York. Exhibition commissioned by the European Commission, featured at its Madou HQ in Brussels. The urban urbane. Exhibition at the Cêntre de Pompidou in Paris and the Europe Festival in Florence. Moments of intimacy in urban living, private gestures in public spaces. Shot high up in the Macedonian mountain village Galičnik, overlooking the Balkan region. Featured at the Contemporary Art Museum of Macedonia in Skopje. Photography assignment of Roma life in Romania, commissioned by Amnesty International. A series of different exhibitions from my work with Roma curated for exhibitions in various venues, including the Nehru Centre, 12 Star Gallery in London, IIC and IGNCA in Delhi, SEM in Slovenia, Pompidou in Paris, European Commission Brussels, Roma Summit Cordoba, Milan, Budapest, Tehran. Published by The Guardian. Some of the art and design work created by Zsuzsanna Ardó | AtelierA can be viewed here and can be purchased by collectors through the Contact page. Poster art and design commissions.